Blog Q & A with Sabrina from "Proposing Dreams"
As a wedding and event florist, we at Sisters Flowers get to work with some great wedding and event coordinators. All of them have their own unique styles and ways of bringing an event together. One of our favorite planners is Sabrina Torti with Proposing Dreams. Sabrina is the best of both worlds when it comes to event design. She has a creative spark and can always come up with new and original ideas. Sabrina also has a very analytical mind that can carry out those ideas in detail. Sabrina is the kind of person that you want going to bat for you on your big day! She is a “no-nonsense” kind of gal and a natural leader. She is a true professional and that’s why we LOVE working with her!! Q: What elements would you bring into a space to help duplicate this look? A: The white palette is a great start for this elegant look. The addition of lots of candlelight and the white branches makes for a romantic and intimate look. Q: How important is venue selection when planning an overall theme and style for an event? A: Budget is more important than venue. Most venues can be transformed if your budget allows. So, knowing your budget will allow you to select the right space for your design, or in reverse, knowing what you can do with the design in the venue you have selected. Q: If a bride had a small budget, what would you suggest to help cut costs while still maintaining a similar feel? A: Fortunately, this is an easily achieved look. White linens are standard, so to save costs you can forgo the higher quality linens. Chivari chairs and covers are costly. You can have white chair covers with gold/beige ties for sometimes less than half the cost. The branch centerpieces really make a statement on their own. Therefore, you can do 1/3 of your tables with these large pieces and still wow your guests. 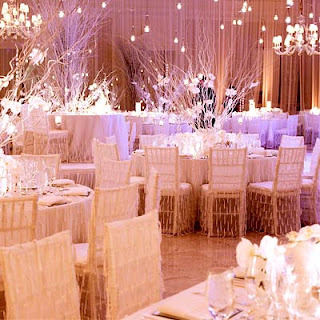 Talk to a decor company (we recommend Exclusive Events) about lighting. You would be surprised the amount of change you can make in a room with lighting. The costs do not have to break the budget either. The reason these tables appear to “glow” is because of pin spot lighting. To achieve that look with just candle light you would have to have tons of candles. At least check into the option. Q: What are some ways that you could personalize a look like this one? A: With a look like this, I would save your personalization for stationary. Some suggestions would be menus with your monogram or custom wedding logo. Another idea is a candy or snack bar with your favorite treats, using bags or containers with your names and wedding date. The curtain in the background can have your monogram or custom wedding logo on it in print or a light (a gobo). Check out Sabrina and Proposing Dreams at http://www.proposingdreams.com/ ! !